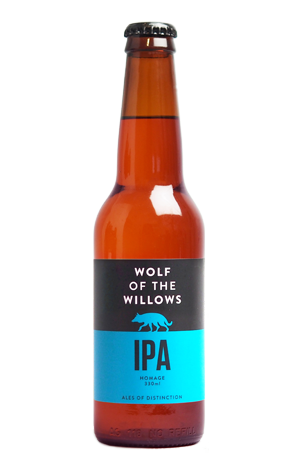 Given their fondness for giving beers a three letter name, it was surely only a matter of time before Wolf the Willows released an IPA (or an ESB, perhaps). And this has now come to pass, with the beer subtitled "Homage" joining their XPA, ISA (India Saison) and JSP (Johnny Smoked Porter). Why "Homage"? Because it's a nod to the West Coast style of IPA that Scott and Renae love, that has laid waste to American drinkers' palates (and thus much of the country's hop industry) and is now carving a swathe through Australia too. To those unfamiliar with the style (if such a thing still exists in the world of The Crafty Pint), it's one based around heaps of hops, just enough malt to keep things from entering palate wrecking territory and enough bitterness to know that, in the words of the long-running 1990s British adverts, you've been Tangoed. In the case of this homage, those hops are Americans Simcoe, Amarillo and Cascade, with Ella flying the flag for the Aussies. And what they deliver is a touch of fruitiness on the nose but much more in the way of pine and resin characters throughout, leaving a pithy bitterness like a landing strip down the middle of your palate so you're left in little doubt that, like the beers to which it doffs its cap, this is one hopped up drop.